There is no stopping “outsourcing”, major corporations from the first world countries especially from the United States and England are into it to save operating costs. Countries in Asia are the top destination for outsourcing, where the wages is ten times lower than those in America and Europe. India, China and the Philippines are the top of the outsourcing chain. 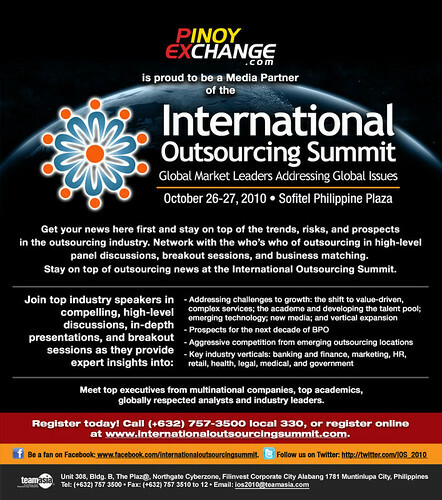 To address the inevitable growth, competition and other outsourcing issues, a group called Business Processing Association of the Philippines (BPAP) is organizing International Outsourcing Summit to be held on October 26-27 at the Sofitel Plaza Hotel. Leading outsourcing companies such as Accenture, Convergys, Dell International Service Philippines, SPi Technologies, Sykes Asia Inc., Teletec, PeopleSupport and other popular names in outsourcing will join the said event.